2004, 295 pages. Genre : Stand-up Comedy. Overall Rating : D+. WWJBTPC? 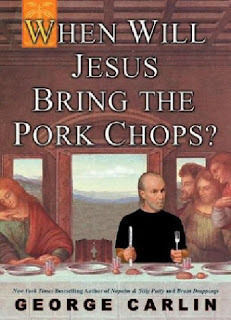 is the last of three books that Carlin put out between 1997 and 2004. It also happens to be his last book period, since he passed away last June. It is the first Carlin book I've read, and is also available as an audio book, with Carlin himself doing the reading. WWJBTPC? is a plethora of Carlin sketches, some of which are transcribed from his recent stand-up acts. It is less witty than I remember his performances. Wikipedia claims that he chose the title because it offends three major religions. Somehow, that seems to sum up the tone and intent of this book. If you have ADD, this is a great read. The maximum length per sketch is about three pages. If he wants to expound on a longer theme (for instance : "euphemisms"), he breaks it down into smaller parts and distributes it throughout the book. "When it comes to God's existence, I'm not an atheist and I'm not an agnostic. I'm an acrostic. The whole thing puzzles me." Good stuff from the man who invented the term "frisbeetarian". Oh yeah, Wal Mart initially refused to sell this book because it was too offensive. And the fundies are disturbed by it. Those are two good reasons to read it. Frankly, 95% of WWJBTPC? isn't funny. Or even witty. It's just bitter. I know this is "shock comedy", and I know Carlin was heavily influenced by Lenny Bruce. But to be honest, I never found Lenny Bruce to be funny either. "Incredibly, there was no Hitler. There is no record of any such person. It's true, there was a little German man with a small moustache who combed his hair to one side and started World War II. He also killed six million Jews. But he was not Hitler. He was, in fact, a shoemaker named Hank Fleck." If there is redeeeming virtue and/or humor in that little diatribe, I can't find it. Maybe the audio book is more humorous. Other reviewers say his earlier two books, Brain Droppings and Napalm & Silly Putty, are better. I guess I picked the wrong book to get introduced to Carlin. In the end, too much of WWJBTPC? just isn't funny. And reading a stand-up comedy book that isn't humorous is like watching Pamela Anderson do a Baywatch episode wearing a burqa. Both are pointless. Skip this one, but if you come across either of his other books, they may be worthwhile. That's too bad, because George Carlin can be funny. I don't like everything he does - I'm not particularly into shock humor - but he certainly did some fun things. I love him doing Thomas the Tank Engine skits. I can't imagine stand-up skits transcribed into print would be all that funny, anyway. Usually things that are funny outloud are no where near as funny written, and vice versa. yep, there is some Carlin poetry and fun-with-words in here that just HAS to sound better when he does them in the audiobook. i'm hoping someone else in the group has read this and liked it a lot better than i did. everyone's sense of humor is different. i have a friend who thinks Lenny Bruce is hilarious. so i went out and found some vinyl LP's by him, and didn't find anything funny at all. I read this book, too. In my copy, about two-thirds of the way through, seven sheets are bound off kilter. When the pages were cut, some pages were stuck together, so that ten are unreadable. To this day, I have never separated them to see what was written there. i can relate, John. i thought this book would be an easy read. it turned out to be a real grind.